Excerpts: teaching to the test? I’ve been dormant on this blog for the last few months, mainly because life has been busy (who’s isn’t) and I’ve been giving considerable thought to this posts topic. This month’s blog is an offshoot of the January 2015 post regarding the (im)Practicality of Audition Lists, and I will warn you that it’s a long one! A reader shared his views with me concerning the alarming frequency at which orchestral excerpts are a requirement of undergraduate auditions in the USA, which quite frankly, I share. I have never been in favor of high school (and younger) students working on excerpts, unless they were performing them with their youth orchestra or advanced enough to be auditioning for top conservatories. This is not to say that young students should never work on excerpts, but that the motivation and logic behind this study is too often flawed. 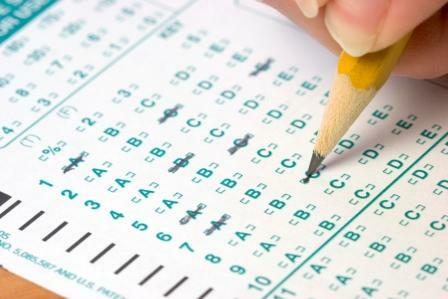 Standardized tests have been under fire lately in this country, mainly due to the concept of “teaching to the test”. Students are prepared to do well on a test, rather than prepared to assimilate and demonstrate working knowledge on a subject. I pose that a direct parallel can be drawn when it comes to young players preparing orchestral excerpts. The bulk of this excerpt training is simply to fulfill an audition requirement (i.e. college), not necessarily to prepare students for an orchestral career. Even more egregious is the fact that many students are simply learning the notes with no consideration of style, historical context, or musical logic. Yes, there will be plenty of exceptions to this statement, but for the most part, it is this bloggers opinion that students are being taught to the test. I have had a similar experience many times when working with older high school students and college students: the solos/etudes sound pretty good, then it’s as if they left the room and sent a life-less drone back in to play excerpts. 1) Why are students preparing excerpts at a point in their development that it may actually be detrimental to their overall musicianship? 2) How/where does the disconnect between music-making and excerpts happen? Let me address these questions one at a time. The study of excerpts is not a negative thing; in fact, I think it’s a great thing even for the non-orchestrally ambitioned player. They teach how master composers treated our instrument, and often offer a window into the evolution of our instrument and its role in the orchestra. However, where the negative aspect enters is when students are taught excerpts when they lack the musical and technical maturity to make informed decisions as to HOW THEY GO! I can comfortably make such a bold claim, as this applies to me. While I didn’t play my first excerpt until my college sophomore year, I was still musically not prepared and I still carry many of those skeletons with me. By this, I mean that some of the simplest, “beginner” level excerpts challenge me the greatest, as I have negative baggage from musically immature study. Perhaps ‘baggage’ will be a future blog topic…. Deviating slightly off-topic, etudes seem to be a vehicle for learning that many students have abandoned, and I wonder if this is a result of their teachers’ abandonment of etudes. There is not a skill or style in any excerpt that cannot be improved and mastered through study of etudes. Well, I might be hard-pressed to think of an etude to help prepare The Miraculous Mandarin, but it’s safe to say that the bulk of the orchestra repertoire can be greatly aided with etude study! I also hold the opinion that many teachers (primarily those of pre-college students) are ill-equipped to be introducing excerpts to their students. Having visited many colleges over the last few years as a guest artist, I’ve had numerous conversations with professors who frequently share stories of students auditioning for them, and playing excerpts that seem to have zero bearing: Tuba mirum blasted and non-legato, The Ride of the Valkyries in 7/8, Bolero without the ownership of any notes above F4….the list could go on. Why are students being allowed and encouraged to demonstrate this ignorance? I theorize that many teachers simply don’t have the knowledge of, or experience with, the excerpts, and therefore blindly pass this ignorance on to their students. Is this really the early teachers’ fault, or the fault of a system that requires students to be practicing Bolero and Ride of the Valkryies at junior high and senior high school age? Like I said a few paragraphs ago, there are always exceptions and the phenoms who buck the norm. This blog is not about those select few, but rather the multitude of students who learn to play the notes without any consideration of what the piece is about, or how their part fits into the grand scheme of the work. The shame of this truth is that this is the next generation of musicians that we are cultivating. I’ve heard plenty of audition-winning caliber players who can play the snot out of their instrument, and could repeat a passage perfectly 10, 20, 30 times. While I’m envious of this technical ability and consistency, something is often missing in the form of personality and flair. Where does this disconnect happen? Let’s address that second question, as if I knew the exact answer, I wouldn’t be someone who struggles with this myself! Listening to my own recordings, I have discovered many inconsistencies. One of the most prevalent (and frustrating) is when it is clear I’m just trying not to miss. What is the repertoire type that I most often have this experience? You guessed it: excerpts. The same syndrome seems to exist with many students. As a community, I feel we put excerpts on a pedestal, and bind ourselves with the idea that they must be this flawless, rigid, unarguable, black & white, Holy Grail of playing that is separate from anything else we play. In the process, the flexibility of an open and musically logical mind goes right out the window. Sometimes we are trying so terribly hard to emulate our teachers, that we lose sight of making music. For example, years ago I was preparing the last movement of Hindemith’s Mathis der Maler for an audition. Being Chicago-schooled, I typically use natural legato wherever there is a slur. A colleague pointed out to me that while my efforts were noble, it sounded sloppy. Well, I’ve heard Jay, Michael, and Charlie do this effortlessly and beautifully, so that’s what I have to do – right? I took my colleagues suggestion to try some light legato-tongue and the result was fantastic: cleaner, easier, and consistent. My point is that I was so self-bound to doing it the way I thought it had to be, that I missed an opportunity to try something different that ultimately worked much better for me. Perhaps the concept that “an excerpt is forever, while an etude just gets checked off” has something to do with the musical disconnect. Does anyone take Kopprasch 15, Tyrell 10, Bitsch 8, etc as seriously as they do William Tell or Russian Easter? Theoretically we should, but those are things that we would never have to perform so why would we be accountable for them? So, perhaps we give ourselves license to have more fun, play with more flair, and experiment more with the etudes. When it comes to the excerpts, we transform to being rigid, authoritative, and perfection-of-execution oriented. Hmm, sounds like I’m describing a robot. Listen, folks, I’m not claiming I’ve got this figured out, and a lot of this blog is an exercise in me trying to wrap my brain around something that has bothered me for years. If nothing else, it’s a chance to kick around some ideas and see if some of these opinions resonate with any of you. I would love to hear from you if you have any ideas/suggestions/counterpoints. At this point I want to recognize my friends at the San Francisco Conservatory of Music, one of the only schools I know of – let alone conservatory – that does not require excerpts for undergraduate admissions. Check out this link and notice how under tenor trombone auditions, incoming freshmen are excluded from the excerpt requirement. The trombone department out there is on to something! Kudos to Mark Lawrence, Paul Welcomer, John Engelkes, and Tim Higgins. Another colleague of mine argues that the excerpts are an even playing field in which you can evaluate if a student has style and personality. While there is also truth to that, I counter that etudes and solos can serve the same purpose, without putting the undue pressure on kids to learn something for which they are not ready. Plus, it is one less opportunity to create baggage for their futures. Perfect segue to a future blog….